The Rubber Cafe Design Team Blog: Pinwheel Fun Fold - featuring Creative Cafe's - kit of the Month for June! 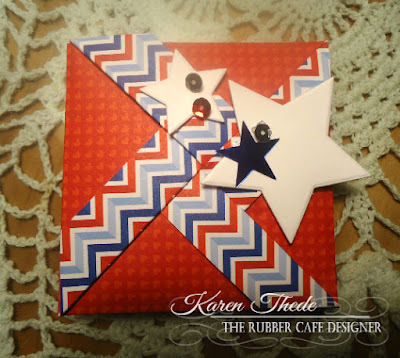 Pinwheel Fun Fold - featuring Creative Cafe's - kit of the Month for June! We here at the Rubber Cafe' - love fun folds! And I just love it when I find one that I've never seen before let alone made. So I was super excited when I saw this one recently shared over on SplitCoast Stampers. 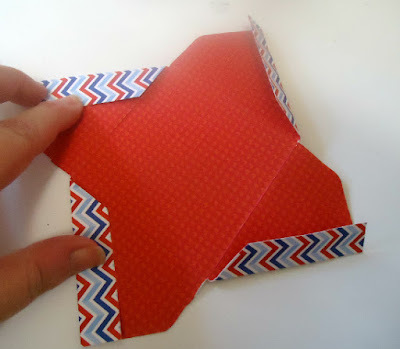 It's called the Pinwheel Fun fold - and here is mine! The card shown on SplitcoastStampers is shown using an 8" square piece of paper and a diagonal score board from Stampin'UP!. 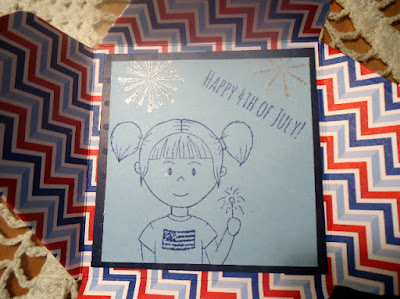 However I changed mine to use a 6" square piece of paper so I could use my paper pad from DoodleBug;s Patriotic Picnic included in the kit. 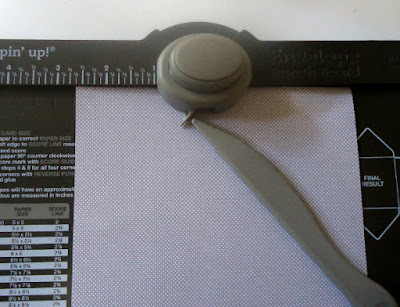 I am also using my We R Memory Keepers Envelope maker to handle the scoring. Line up one side at the 2 5/8" mark- and score. I don't use the punch with this as it not quite the right size. Continue scoring around each side always lining up the left hand side at the 2 5/8' mark. Below you'll see you get a v- pattern from your score lines crossing over each other - these you will your scissors and cut out. 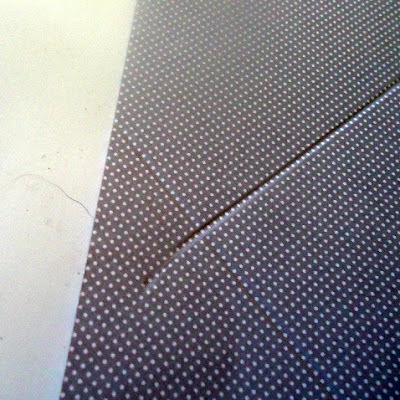 Once you cut each corner it will look like the image below. Next you'll score the 3/4" flaps - lining up the inside corner on your Score-Pal, you can score each side. As you can see below once your scoring is complete, score and fold each area. 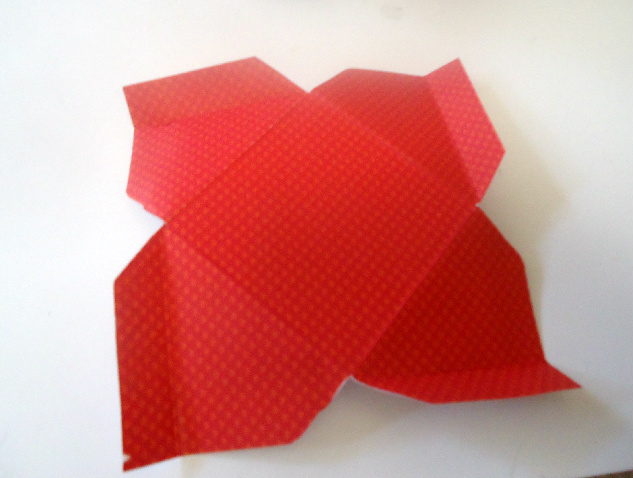 Scoring the flaps back on each section - you'll get the contrast area, that will provide you with the Pinwheel look when the card is folded close. You're now ready to fold close your card - start at the bottom and fold it up next fold the left side down and then the top over the previous side finally take your last piece, and curl it inside tucking it down as you can see in the third picture below. 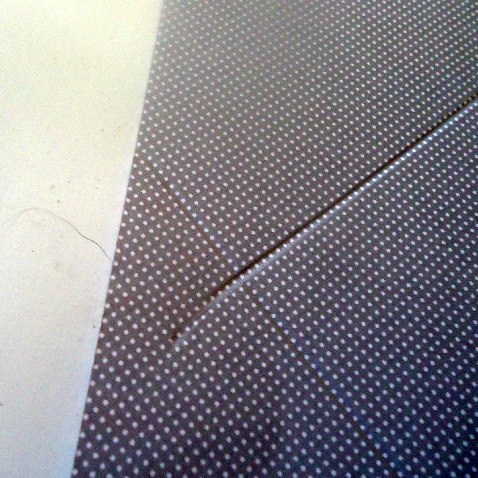 Finish the inside with a 3" square and a lighter square cut at 2 3/4" . I stamped my images and a Happy 4th of July phrase. On the outside I finished my card with stars and sequins included in the kit - here's another look at my finished card. 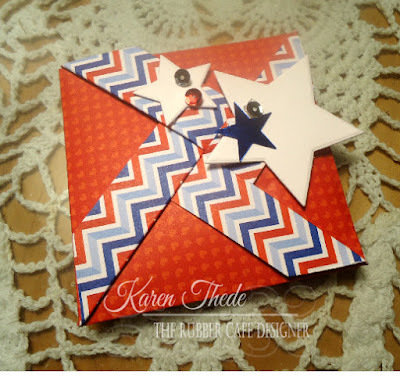 Tip: Be sure to keep any embellishments free from the edges so you can pull it out and open. I really hope you will give these a try, they were really fun, and quick! Thanks for stopping in- have a great weekend!